There is something special about sharing fishing experiences with friends and I am lucky to have an opportunity to meet and make friends with many people in and around the fishing industry. 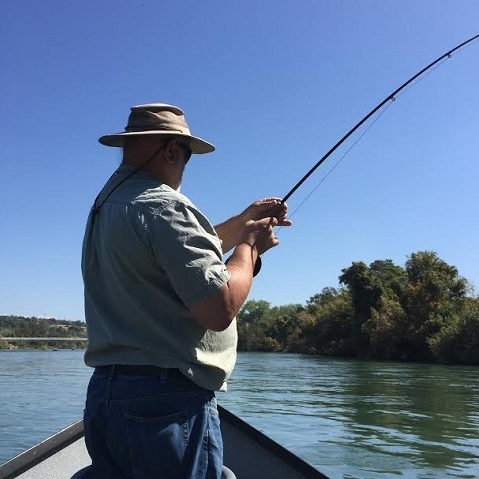 I had the opportunity to enjoy a great afternoon this Wednesday with guide and friend Lou Hubert on the Sacramento River in Redding. This was my first, but certainly not my last, outing with Lou who managed to knock the rust off this occasional fly angler and put me onto some outstanding Rainbow Trout. 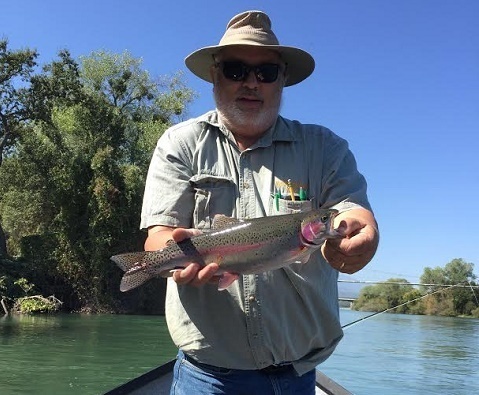 We launched around 11am at the Posse Ground ramp, located just north of the iconic Sundial Bridge in Redding and pushed upstream a bit awaiting the appearance of the caddis hatch. While it is possible to see the caddis on the water and in the air the most useful indicator for locating the hatch was the large number of dragonflies hovering above the river. With the trout below and the dragonflies above, the caddis seemed doomed. The wait also allowed Lou to offer some basic instructions and reminders, as well as set up the rods for the action ahead. The setup for the day was to be a 9 foot leader with size 14 Birds Nest followed by a size 14 Cinnamon Pupa dropper under an indicator. Note that it is popular to employ a 2 dropper, 3 fly set up on the river, especially during the egg imitation bite when the salmon spawn is occurring. Positioning the drift boat along various seams and runs, Lou offered helpful instruction on rod position, proper line control ( aka “keep your fingers on the rod with the line in between at all times and don't let go”), and constant mending instructions to maintain a proper drift and fly presentation. As he knocked the rust off my casting techniques, we were quickly afforded numerous indicator takedowns. I use the term “we” as it is the skill and effort of the guide that puts the angler in the position to set the hook on a takedown, a concept that Lou endorses, we work as a team. 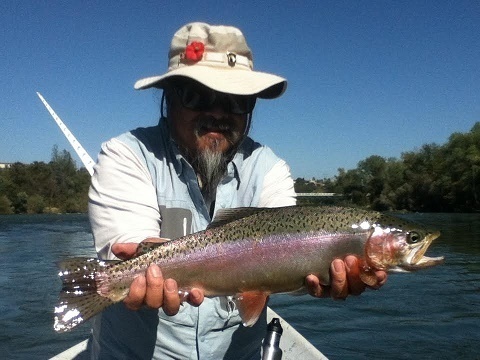 It didn't take long to hook into the first of many Sacramento River rainbows. These are wild trout that rip, drag and put a bend in the rod, challenging any angler in bringing them to the net. While I did manage to bring five beautiful trout to the net, unfortunately, my hook set and landing ratio also showed a bit of rust as I did miss a number of takedowns and I had a number of trout come unbuttoned after a brief and spirited fight. Self-critiquing, I needed to keep the rod a bit higher, with a sharper instead of a pulling hook set action, along with not taking my fingers off the line. It just tells me I need more live action practice. The trout landed were full of Caddis and in fact, every trout brought to the net were hooked on the bottom with Cinnamon Pupa. Unfortunately my work demands called for a short trip, being off the water during the height of the hatch at 3pm. Lou's friend and fellow guide John Larsen, and his anglers, Al Tom and Ed Jews, enjoyed a 25 fish day between them on a full day extended trip. Had I converted on just a few more hook sets, and keeping hooked trout to net, I could have easily had a dozen or more on this abbreviated outing. The current caddis hatch is outstanding and things will only improve, if that is possible, for trout angling on the river once the salmon spawn begins. The egg bite can be beyond outstanding. And even though the fishing is right through the middle of Redding, you hardly notice. Excepting a couple of highway bridges, the backdrop is very beautiful, with an abundance of waterfowl and even a few bald eagles adding to the natural setting. Lou's helpful instruction and attention to both boat and angler afforded me great opportunities to enjoy this red hot Caddis hatch. Lou's easy going manner and banter is such that while you may be going out with a guide, you will always leave as a friend. He truly enjoys and shares in his angler's success and experience. Lou also offers outings on some of the local lakes for trout and kokanee. To reach Lou for a great day on the water, call him at 805-610-9412 as I am already looking forward to the next adventure with my friend.